Only you can decide if this Balenciaga Purse Hexagonal Wall Niche Display carries the theme so far as to be called a honeycomb. The many geometric indents reflect hexagonal pedestals that outfit the balance of the department floorplan. The slight green tint to the niche interiors adds to the interest and contrast with merchandise presented. 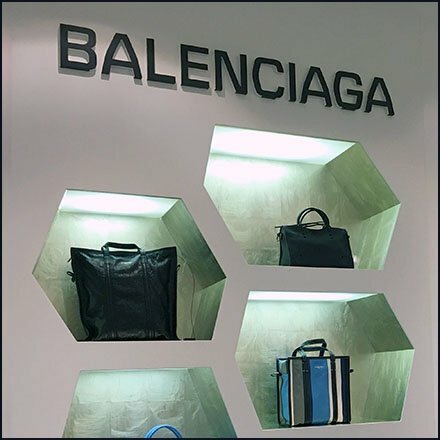 This Balenciaga Purse Hexagonal Wall Niche Display seen at Neiman Marcus, Short Hills Mall, NJ.